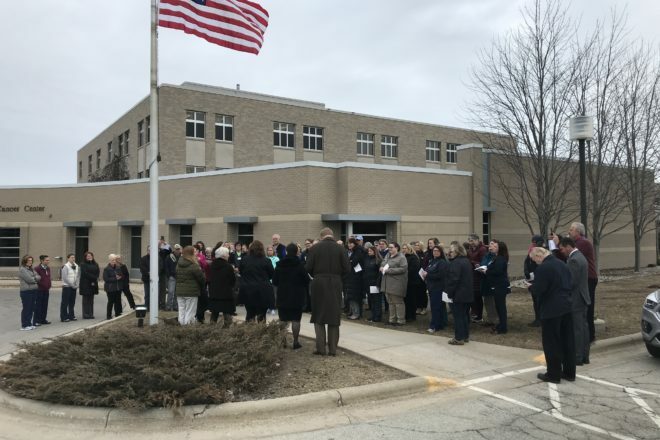 About 60 community members and employees gathered near the Door County Medical Center’s entrance to take part in a statewide Donate Life flag-raising ceremony and period of silence on April 1. The hospital was among the more than 80 Donate Life Wisconsin member and partner organizations that participated in the event, which promotes organ, tissue and eye donation and honors organ, tissue and eye donors and their families. The Donate Life flag was introduced in 2006. Since then it has become a national symbol of unity, remembrance and hope that honors those touched by donation and transplantation. During the past 13 years, 50,000 Donate Life flags have flown across America.